Schumann Quartette Real Photo - Entertainers - Real Photo - Vintage Postcards | VintagePostcards.com: vintage, old, antique postcards for collectors. 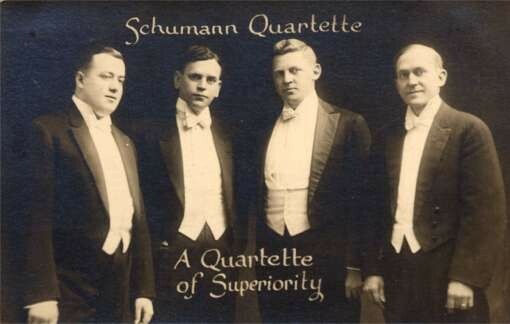 "Schumann Quartette. A Quartette of Superiority." Photo by The Sommer Studio, Philadelphia, Pennsylvania. "Schumann Quartette. A Quartette of Superiority." Photo by The Sommer Studio, Philadelphia, Pennsylvania. Music, singing.